InVogueJewelry: About Diamonds--CUT: Trilliant, Trillion, Trielle...? About Diamonds--CUT: Trilliant, Trillion, Trielle...? A diamond's cut is crucial to the stone's final beauty and value. And of all the diamond 4Cs, it is the most complex and most difficult to analyze. The Cut unleashes the stone's light. We often think of the shape of the stone---round, square, rectangular, oval, pear, heart, triangular---but really the CUT is more about how the facets interact with light. Incredible workmanship is required to cut a stone so its proportions, symmetry, and polish deliver the most magnificent return of light. The majority of diamonds are round brilliant cut. Other shapes are referred to as "fancy cut" stones---gemstones as well as diamonds. There is a lot of information about each cut, so today I want to share what I've learned about one cut: the triangular cut---trilliant, Trillion, Trielle, Trillian, Troidia and Trillium! Some triangle cut diamonds have sharp corners—fragile, vulnerable to chipping—while others have clipped corners. Sharp cornered triangle cut diamonds can use specially molded V-shaped prongs (like a marquise) and clipped corner triangle cut diamonds can use standard prong designs. Trilliant is the name given to diamonds having a triangular shape with brilliant facets. 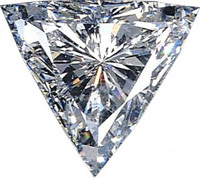 Triangular brilliant diamonds are also referred to as Triangular Brilliant and Triangular Modified Brilliant. Originally designed and patented by the Henry Meyer Diamond Company of New York in 1962, the patent has now lapsed and that is why "trilliant" is used as a generic term for triangular shaped diamonds. Trilliant Cut is a variation of the modern brilliant cut with 44 facets. The stone is step cut on the crown and brilliant cut on the pavilion. This cut has triangular shape with very sharp and pointed edges. An overall depth of 32% to 44% said to be the best for great brilliance. A trilliant diamond is generally used as side stones rather than as a solitaire. However, the trilliant-cut solitaire is becoming more popular, and is beautiful and unusual. This is the traditional and original triangular diamond, with slightly rounded edges. It was created in Amsterdam by Leon Finker in 1978. 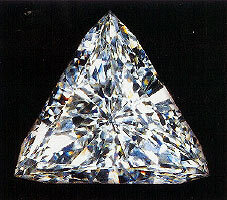 A variation of the modern brilliant cut, it has 31 facets. Both the crown and pavillion are brilliant cut. 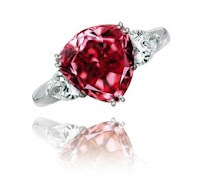 The Moussaieff Red is one of the famous trillion cut red diamond. It weighs 5.11 ct diamond and is regarded as the largest Fancy Red diamond ever rated by the Gemological Institute of America. This triangular cut diamond was created and patented by the Trillion Diamond Company. It is trademarked by the Trillion Diamond Company. Every Trielle diamond is an equilateral triangle with 50 facets---41 facets on the table and culet, plus nine girdle facets. Trillian, Troidia and Trillium are examples of other names for triangular cuts. A Word About "Russian" Diamonds, CZ, Etc. What is "Zentrumite"? Vaseline Glass? BALTIC AMBER: "The Living Gem"
Gem ❤ Love ❤: GARNET!